What do you get when you put together freestyle motocross and trampolining? It’s called tramp biking, and it’s already taking off in Europe—not just as a form of practise for the BMX pros! Today, we want to take a look at the amazing activity, and see just what these special bikes are and what the tramp bikers out there can do. We’ve thought of practising skateboard techniques on your Vuly—so we brought you the Vuly Deck, and we’ve talked about beginner and intermediate skills before—but a whole host of people around the world have taken to learning and performing incredible bike tricks on their trampolines. Fun sport of tramp biking – What is a tramp bike? Just like how a Vuly Deck is a skateboard without the trucks and wheels, a basic tramp bike is a bicycle without any tires; in fact, a tramp bike leaves only the frame, fork, seat and handlebars! Secured padding around any sharp edges prevents damage to the trampoline. *Remember: Damage to a Vuly trampoline that results from tramp biking is not covered by warranty. If you’re interested in riding or freestyle BMX, tramp biking can be a safe and inexpensive way to learn exciting, new techniques; you don’t have to leave the house to practise. What can you perform on a basic tramp bike? Any trick that involves getting airtime (which is a lot of tricks)! Freestyle BMX has a lot more aerial tricks than skateboarding does, and unlike skating, most don’t require forward momentum or extremely fine foot movements to get the right feel for the technique. You can try out those tailwhips, 360ºs and Supermans much more easily than a kickflip. Tramp biking isn’t just for by BMX riders who want to practise their latest moves; it’s also becoming a sport in itself! Last year, the Tramp Bike World Championship was held in Kirchenlamitz, Germany. A mammoth 33-hour event—where athletes perform their best stunts within 45 seconds—the World Championship required no special qualifications to participate. Don’t let that fool you! 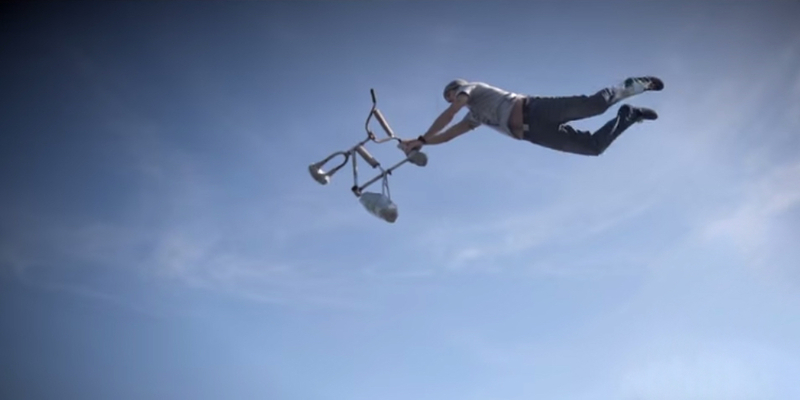 These guys can pull off some incredible tricks on their bike and trampoline combo.